Polyscience is one of the most trusted sous vide brands in the professional kitchen, but they generally price themselves out of the range of the home market. When they released the Sous Vide Professional they managed to bring the price point down to 799.95$, which was still several hundred dollars away from the consumer appliance range. Today, Polyscience is consolidating the brand names of their circulators by renaming the 7306 aka the Sous Vide Thermal Circulator to the Sous Vide Professional - Classic Series. It also got some minor cosmetic changes to reflect the rebrand. The Sous Vide Professional will henceforth be known as the Sous Vide Professional - Chef Series. But this probably isn't interesting to anyone except for myself. Cause, as someone who covers the sous vide appliance market, I can tell you this: no one cares about this stuff except for me and like ten other people. The exciting news (to you) is that Polyscience also announced the Sous Vide Professional - Creative Series. The Creative series is "Specifically designed for the casual user", which is code for "This is the new consumer option from Polyscience". Priced at 499.95$, this model has a number of differences from the Chef Series. But lets get to the nitty gritty. The Creative can heat a 20 liter bath to a maximum temperature of 99ºC within 0.1ºC, and has a fixed flow rate of 6 liters per minute. Contrast that to the SVP Chef which can heat a 30 liter bath to a maximum temperature of 100ºC within 0.07ºC, and has a variable flow rate of up to 12 liters per minute. According to the website, the Creative takes up the same amount of space as the Chef (14.125 x 3.875 x 7.375 in), but is significantly lighter (5.5 pounds versus 9.5 pounds). There are some other things you give up, including some failure mode indicators, the cookbook and the storage/carry case. For the home user, the Polyscience Sous Vide Professional Creative Series sacrifices things you won't care about, and gives you (most of) the things you wanted at a pretty great price point. For those not paying attention, the Nomiku is a kickstartered approach to launching an immersion circulator company. The exciting news is that the Nomiku team has exceeded its $200,000 goal. And by exceeded, I mean, they blew the doors off. They still have over a week left and they have raised a total of $309,073. Most of the money raised has been through 829 people effectively pre-ordering the Nomiku at 299$. While I think the fact that geek new outlets covering this stuff overlaps nicely with the Nomiku's target market, I also suspect that this is really good news for anyone in the sous vide business. Even if it means another competitor. 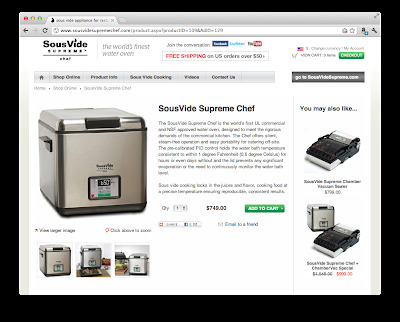 Eades Appliance Technology LLC, the folks who brought you the SousVide Supreme and the SousVide Supreme Demi, just launched their third appliance: the SousVide Supreme Chef. 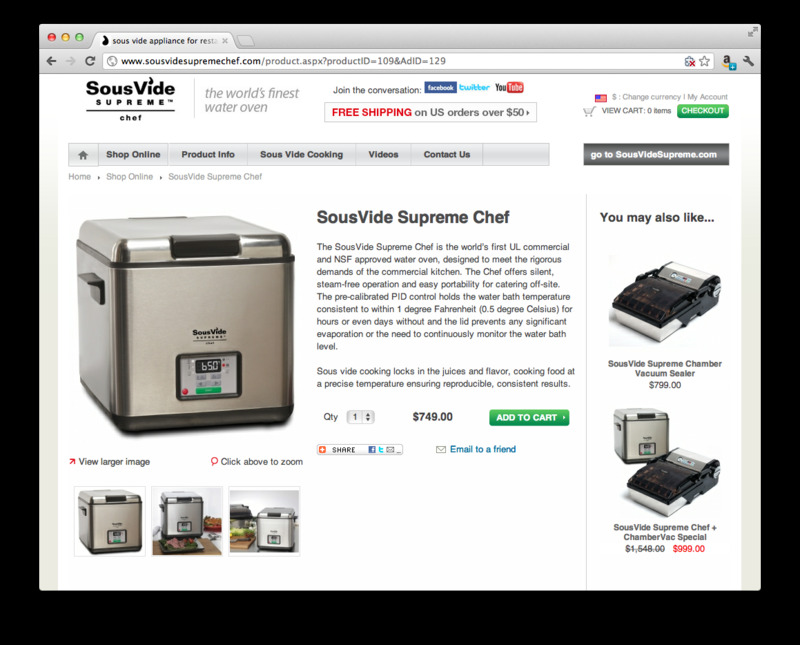 Along with this commercial version of the original SousVide Supreme, they have launched a new website to go along with it. The price of the SVS Chef is 750$ USD, which I believe is telegraphing where they think they can win against other, more established players in the commercial sous vide market: larger kitchens. The only way I can see a purchasing justification of 250$ more than the SVS is that there are kitchens where UL and NSF ratings influence the decision. It's a challenging price point, because for an extra $50, you can purchase a Polyscience Sous Vide Professional. The SVP can handle about three times the volume that an SVS Chef can with a higher degree of accuracy. Being circulated, it is also going to be able to recover from the temperature drop when larger quantities of food are placed in the water bath. These factors are pretty compelling from a cook's perspective. Of course, important to note, that there could be other differentiators to establish value at this price point, but I haven't seen them yet. While I was researching the SVS Chef I did uncover that there could be another variation of the product that we haven't seen yet. The UL listing for the SVS Chef had two model numbers, the SVS10CN (a.k.a. The SVS Chef) and the SVS10C, which could be something we haven't seen yet. Ultimately, I think having a model geared towards the professional kitchen makes a lot of sense. I am curious to see how the SVS Chef fares in the marketplace. Anyone considering purchasing one? If so, tell us in the comments below?